There is a blank .syx file (called blanks.syx!) within the patches that @Littlewoodg linked to, which is a good starting place to store all your favourites. Here’s a video on how to copy a patch from one bank to another. I can confirm that the Dixie, especially the dyna piano patch sounds wonders with FAC chorus, and should be even more grand if coupled with a reverb. The choice of implementing the delay effect in the app, and only it, is very odd. I wouldn't put any delay after an FM patch as it adds a lot of mud to the timbre due to the synthesis nature. Small annoyance: every time I fire up the Dixie, either standalone or AU, the portamento is activated and the max notes are 16 even if it shows 64, disregarding the settings from the previous session. Thanks to @Trueyorky and @yowza for outlining that trick about how to make a "Favorites" sysex bank! I'm making just a handful of them with my favorite 32 basses, leads, pads, etc. Now I'm really interested in the ability to export .syx files (whether by "Open In", email, or whatever), because this is basically giving me a way to create custom .syx files on a mobile device, and would make it considerably easier to switch content on and off of a Volca FM. Or just to store DX7 patch content in organized fashion, generally. The method outlined herein is a little tedious, but it definitely works and is reliably repeatable. Thanks! so to export a SYX from Dixie, copy to iCloud folder and use the Files app (until a share option is added). edit: A quick test reveals this is working well if you also another Volca FM editor like Patch bay. It 's managing to open SYX files I couldn't play before on Volca FM when I sourced them directly via the web so it seems to be optimising them a bit perhaps? MiniSynth is AUv3 compatible ?!?! Didn't know that !! If yes, that's game changer ! Of course, the "Files" app! I thought that might work, but hadn't tried it. Yes, I was able to save a Favorites folder in my iCloud folder and move it to Volca FM Buddy, which is the free app I prefer to use to send over patches to my Volca. Really, with this combination of apps and workaround, you don't need the $20 Patch Base purchase anymore. You can edit patches and even move them around to different Sysex files for safekeeping, and then CV them to a Volca using a 3.5mm cable. This is absolutely great. It's really kind of a shame that Korg just threw this product out into the market expecting that power users or 3rd party developers would just solve all of these problems for them. I wonder what percentage of people who buy the Volca end up just stuck with the initial 32 voices and either never figure out or never bother to change out the sounds. Thanks again for the assist! Getting back to the app itself, we've been going on and on about the Volca because of all the functionality KQ Dixie adds to it, but KQ Dixie is probably a superior software emulator than what the Volca offers. Even if it were tied or close, the AU functionality allows you to add effects and tweak patches much more easily than you could do with the hardware. What a terrific app! It is indeed! 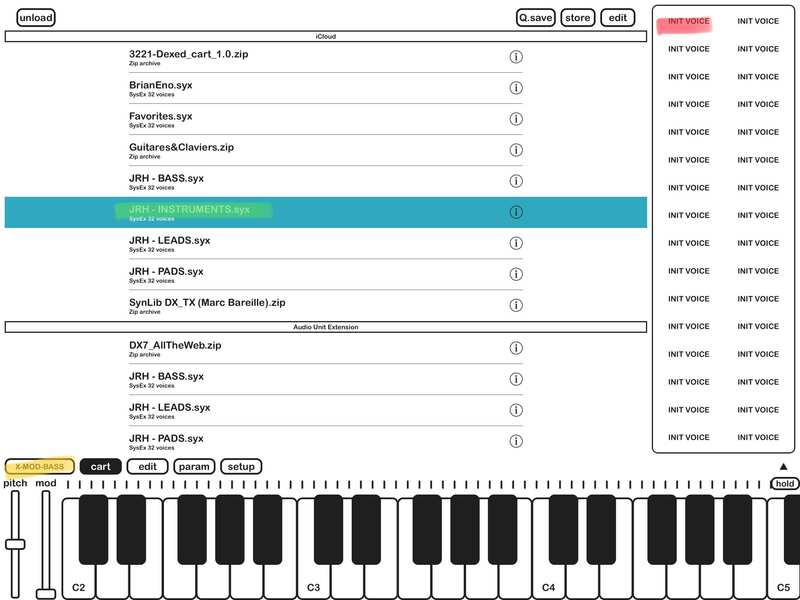 KQ MiniSynth Modular was one of the first AU Instruments available on iOS and it's universal. It's tied for the second available AU with NS1. iSEM was the first. For anyone looking for folder structure for patches, why not try exporting the banks somewhere, creating a zip file, then opening the zip file? I should be working right now so no time to try it, but makes sense to me. My own strategy at the moment is creating at least one favorites bank, then banks for Bass, Piano, Organ, Brass, etc. As I mine those archives, I dump them into the appropriate bank. The only bothersome part of this process is getting back to where you were in the archives to continue the search. Some sort of bookmark process for that would be cool. After a bit of Googling I found an 'Init' bank that's a good starting point. Inside Dixie I just make a copy and rename it and once i've filled a few of those I can dump them into a *.zip file as suggested making things pretty smooth. Dixie supports Files.app so I can just dump them to either AudioShare or Documents and Zip them before moving back into Dixie. The Dexed cart is one of the best DX7 'patch archives' as great care has been put to cleaning up duplicate *.syx files. (There's some pretty weird patches to be found). That should work, but I think I tried to do that with a zipped file on the first day it was released, and it did the invalid archive thing. There has been an update since then, so maybe it's something that cleared up. That would be the way to do it, though, within this file structure. I'm happy enough with just making different sysex files for bass, leads, etc. You do get 32 patches within each one. There aren't that many must-have patches I can recall by memory, anyway, as the AudioKit FM app showed - I think he had just a few dozen in there and it was a great summation of some of the best DX7 sounds. This page has a pretty good list of what to expect in the patch banks. Aaaaaaamazing. This is also what I’ve been looking for to start making my own patches! App has been updated with a number of requested features. Another super-responsive dev! Thank you! Outstanding! These may seem nitpicky administrative things to people unacquainted with the app, but this level of (lightning fast) responsiveness really is impressive. Quick Save appears to lock in whatever changes you've made in the cart you currently have loaded (instead of having to go through and type in the exact name of it and do an overwrite). It may do other things I haven't figured out yet. Seems like it would save a lot of time. Renaming is nice touch to stay organized, and I can confirm that the Export feature worked with Volca FM Buddy. It is not necessary that you tap the patch name. Turn on "store" in cart, select a patch on the right frame, and you can store the patch. @RyoutaKira Thank you for your work. Quick save generally works, but seems to have a glitch where the "Quick-Saved" category at the top of the "Cart" screen may appear blank, or fail to update until you restart the app. I thought it didn't work at all the first time I saw it, but then restarted and it populated with all the quick saves I had attempted previously. It doesn't do exactly what I thought it did, but might be useful for other reasons. What it seems to do is automatically save a "32+1" sysex file for whatever "bank" or "cart" you currently have open. So, in the screen below, "GuitClav4.syx" is the bank that will get saved if you click on "Q.Save" in the top right. That will create a new 32+1 sysex file in the Quick Save area. (Because it's a 32+1 file, it should also store the currently loaded patch, which "X-MOD BASS", as indicated in the bottom left near the pitch/mod controls). But if you quick-save the same bank again, it will rename it GuitClav4 1, GuitClav4 2, etc. For overwriting your favorites bank and making your own banks with custom voices, I think I recommend following using Step 5b in my directions below, instead of Quick Save. Quick Save is better suited for if you are browsing through a bunch of folders in a large zip (like the Dexed or "All the web" one) and come across an interesting bank you want to keep. Quick save is useful for that, because if the patch is called something like "Analog57", good luck getting back to where you were if you leave that screen! I do not believe there is an option to use quick-save to just overwrite and existing bank in any of the 4 categories. Maybe that could be a feature, similar to how it behaves if you are storing a "new" bank and name it the same as an existing one. The workflow for this, then, is that you can Quick Save your "favorites" bank and just keep creating new ones. Eventually, you'd load up 32 of them (I guess? ), and just copy and paste it to the iCloud/AU/IFS section, and rename it to what you want. (1) Click on the voice and make sure it is displayed in the box on the bottom left (shows "X-MOD BASS" in the picture above). (2) Back all the way out of the patch menus and click on the bank where you are trying to save your voice. In my picture below, I clicked on the JRH - INSTRUMENTS bank (highlighted green), which displayed 32 "INIT VOICE" patches on the right. Notice that "X-MOD BASS" still shows in the active patch box below. (3) Click STORE at the top of the screen. X-MOD BASS should still show as the actively loaded patch. (4) Touch the destination slot where you want the patch to be stored. This would be the slot I highlighted in red below, which should now change to display "X-MOD BASS". (5b) Click "Store" and then click on the same patch again (green highlighter) and it should give you the option to overwrite that patch, saving the changes. I believe this is new as of the last update - it used to require a few mor steps than that. NOTE: If you do anything else between steps 4 and 5, the bank will just revert to whatever it had in it before you saved it, and the new voice will not be stored in there. Don't think this has already been posted here, but there was a DX7 comparison and you could definitely hear the differences between the real DX7 and Dixie, especially in how Dixie seems to have a very slow chorusing effect compared to the real synth. @vitocorleone123 - Thanks for posting. The video is over an hour, so I just peeked in to bits and pieces of it. 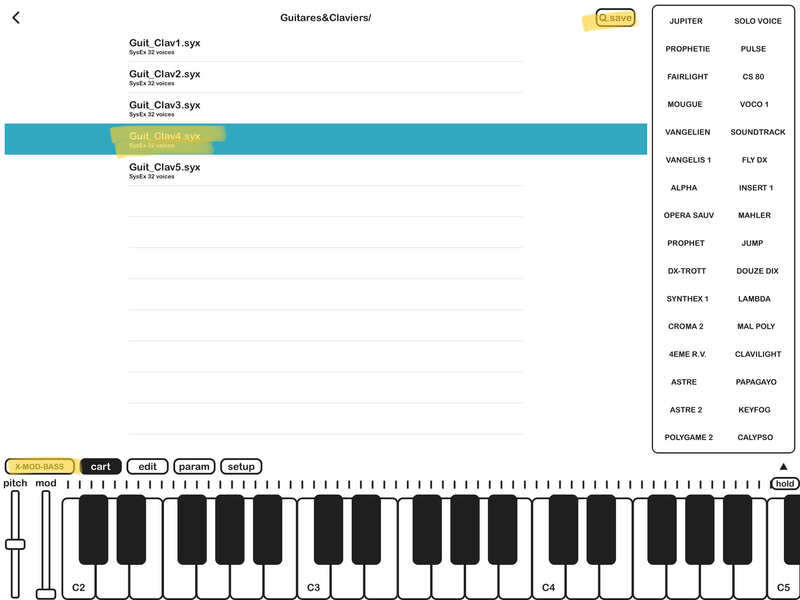 To me, the comparison between a real DX-7 and KQ Dixie, a $4 iOS app, is nearly irrelevant. A lot of people are interested in FM sounds that either can't or don't want to own an 80's era DX-7. Also, if the point of reference for all these sounds is always "how they sounded on a DX-7", then nothing is ever going to best an actual DX-7. It's just a question of how close it can get, when the real question should be "does it sound good? ", or "is it easy to use?" Comparing Dixie to Dexed, or maybe even the Volca FM, on the other hand, makes a lot more sense. FM Player, less so, because my recollection is that it's merely a sample player, not an FM synthesis app that can read .syx files. 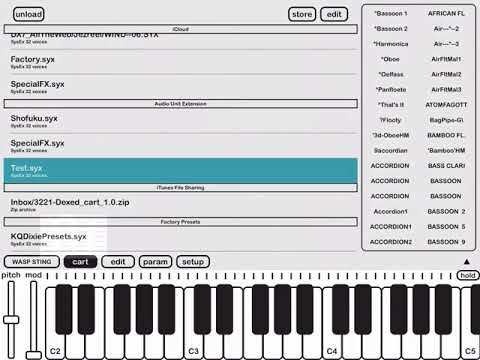 And Dixie is still the only app in the App Store that can load a DX7 file and play it within the ecosystem of iOS music, so there's obvious value in that. I will say that I own the Korg Volca FM and while most aspects suggest that Dixie is a far superior FM synth (significantly more polyphony; much better access and ease of use for loading and manipulating patches), it really is a symbiotic relationship between the two. Being able to audition patches on Dixie makes the 32-voice limit on the Volca far more workable.